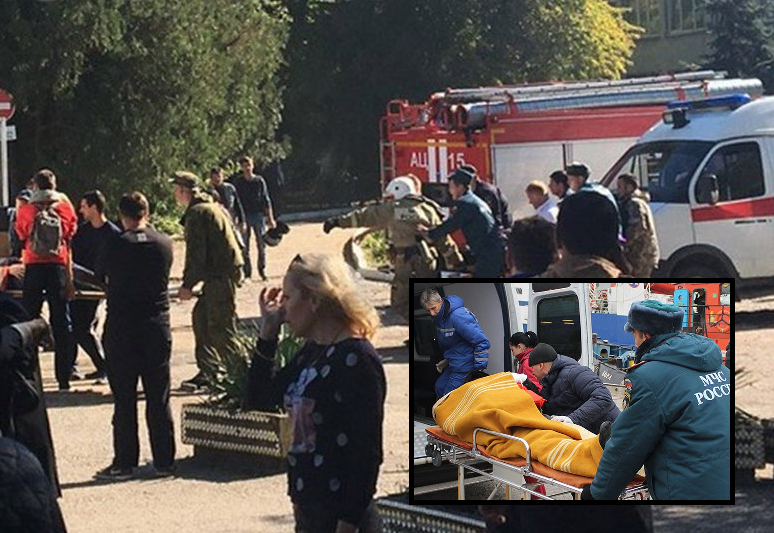 Russian President Vladimir Putin’s spokesman just confirmed that the Kremlin indeed was looking at a ‘terrorist related incident’ for the explosion that killed 18 (so far) and left 70 wounded in a school in Kerch this morning. The city is located in the Crimean province which Russia annexed from Ukraine in 2014. The “possibility of terrorism is being considered,” Mr. Dmitry Peskov told Russian reporters on a conference call. Details are still sketchy but an apparent explosion this morning was followed by gunfire after which special forces rushed into the school and apparently shot the terrorists (if witness accounts on social media are to be believed). Initial reports about the explosion in Crimea (the Black Sea peninsula which Russia annexed from Ukraine four years ago as it wanted to protect its port city of Sevastopol where one of its fleets is located) cited law enforcement sources as saying the suspected cause was a gas canister blowing up. However, by now local television is showing the head of the college describing an armed rampage with attackers gunning down pupils and teachers, leaving bodies strewn throughout the building. At least one attacker blew himself or herself up, the school director Ms. Olga Grebennikova claimed. According to the school director, the attackers “ran with automatic rifles, I don’t know what they were, on the second floor, opening offices and killing everyone they could find”. Putin needs to annex the entire country and then round-up all the terrorists and execute them. Well one welcomed difference is that Putin will not be placing flowers and teddy bears at the school . He will be too busy hunting these savages down. Russia needs to crush jewkraine hohols and geyrope.